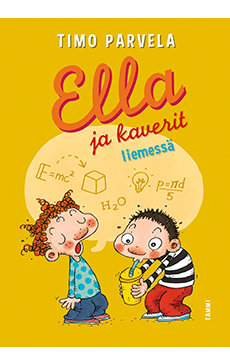 Ella and Friends in a Pickle takes readers on a fast-paced adventure bursting with quirky wisdom, offbeat humour and zany situations. What happens when Ella and her friends drink a milkshake that transforms them into supergeniuses? Their teacher thinks it’s all thanks to his own superior teaching skills and decides to milk the situation for all the happiness, reputation-building and recognition he can. As a result, the teacher and the kids all end up in a real pickle. Ella’s teacher is stressed out. He’s got tummy-ache and he’s nervous. That’s why his wife made him a stress milkshake. However, the milkshake has some unexpected effects on the pupils after the teacher gives his nasty-tasting morning drink to them. “Anna, Anu and Ari want to share these nine apples equally among themselves. How many does each one get?” the teacher asked. “Right, so the shares would be 4, 2½ and 2½,” Tiina responded. “But the apples are different sizes. The question shouldn’t be how many apples each person gets, but how much,” I reasoned. “So they should mash up the apples first, weigh them and measure their volume. That’s the only fair way to divide them up,” Samppa added. “But what if Ari’s allergic to apples? What does he get then?” asked Pukari. “I think it’s stupid to eat the apples right away. It’d be better to bury them in the ground and grow three whole apple trees for each person, and then they can either eat or sell the harvest,” Pate said, ending the discussion. We grinned. Suddenly we had become really smart. Our teacher, on the other hand, stared at us and then pinched himself. We didn’t think that was very smart.